In 2000, a small start-up called Snagajob was founded by Shawn Boyer in Richmond, Virginia. After raising over 40 million dollars from private investors, this job aggregation website has become on par with services such as Monster.com and Indeed.com, breaking their 65 millionth user mark in the year 2015. The website focuses on job hunters seeking hourly employment, rather than those in a specific salaried career. Snagajob is notable for it’s humorous attempt to break the ice with new users, giving job hunting a light-hearted feeling with a comical website and casual tone throughout. Snagajob is in fact the largest job aggregation site that features hourly employment listings. With thousands of part-time and full-time job postings, which turn over often due to the nature of hourly work, the stream of job opportunities is nearly endless. 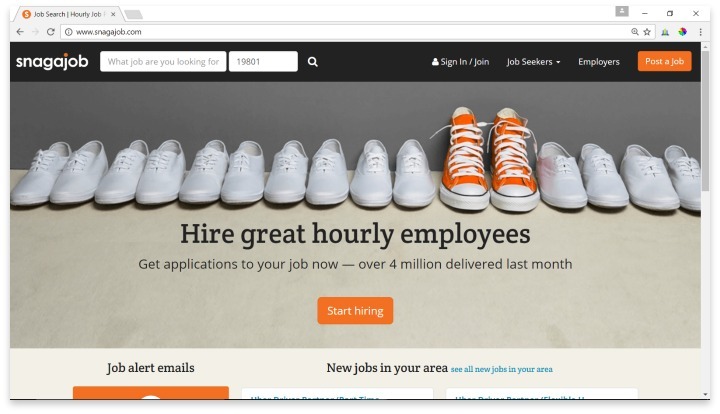 Snagajob is linked with a website called MyPerfectResume, which offers templates and formatting tools that help users write a better resume, tailored to the specific job they are considering. Users can receive email alerts for new jobs listed in their industry, and the industries range from healthcare to fast food to military service. Anything that is paid by the hour is featured on Snagajob. Their website includes a forum with job tips for those searching for hourly work, and the Q&A feature allows users to ask questions related to job searching. A Snagajob expert will answer the question soon after. Despite being the best place for hourly job hunters, Snagajob is missing quite a few important features. There’s no way to apply for a job directly through the website, and this means that all the information uploaded to help narrow down a job search must be re-typed on the employer’s website later when users apply. Additionally, the search feature is not as straightforward as it could be, requiring multiple drop-down menus to be opened, and lots of scrolling. Playing off their humorous and casual website, the employees at Snagajob record videos that give tips for interviews and other relevant topics through often comedic or downright silly ways. Their customer service is, as expected, friendly and typically very helpful. Despite the frequent user complaint about the many ads that Snagajob’s website features, they do a great job of keeping their boards largely spam-free. And for employers, jobs are easy to post and don’t require any special set up since applicants are re-directed to the company’s site for the actual application process. Snagajob is the largest job aggregation site that features hourly part-time and full-time job postings. For job hunters seeking an hourly position, there is no better job aggregation website out there than Snagajob. Even if you find the funny videos and joking tone not to your taste, the casual layout and relaxed atmosphere makes job hunting much less stressful. There are just enough resume and interview resources to make Snagajob a true help to those who need it, but the extra features don’t get in the way of the main point of the website: connecting users to a job. The search function’s clumsiness isn’t that hard to get used to, and considering that all of the features are free, the ads are a necessary evil that most users can easily ignore. Have you had an experience with this company? Please share your Snagajob reviews below.